How do you get connected to Internet? To get connected to Internet you need to have a subscription with the Internet Service Provider (ISP). What happens when you get connected to Internet? ISP will give you an IP address which is unique throughout the World. If you are given with static IP, then the IP will not change every time when you get connected to Internet. But if it is dynamic, then IP is given when you get connected to Internet. What happens when you type the address (URL) of a website say www.example.com in the address bar of any browser and press Enter key? Your website name (URL) will be resolved to the IP address. IP address is resolved with the help of DNS (Domain Name System) server. DNS server has the entry for domain name and it’s corresponding IP address. This IP address corresponding to the domain name means, it is the address of the machine on which the website which you want access is hosted. For example if the resolved IP address is 192.168.0.1 for example.com, it means files corresponding to website example.com is stored on the machine with IP address 192.168.0.1 and this is unique. What is that your computer does with the resolved IP address? It creates the packet which has to be sent to machine with IP address say 192.168.0.1 with destination IP address as the resolved IP address (in our example say 192.168.0.1) and source IP address as the IP address given to it by the ISP. 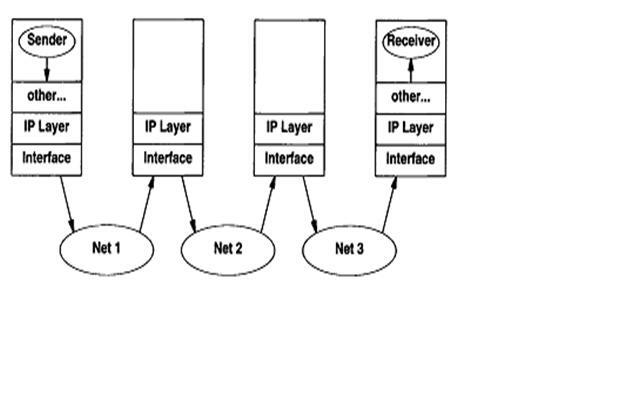 The network layer places this IP address in the packet along with other control information so as to make the packet reach the correct destination without any errors. Now the packet is sent to the Data Link layer which places the hardware address of the source that is the machine which is sending this packet and destination physical address as the address of the next router in the path. How these packets reach the destination? The packet when reaches the first router it is passed to the Data Link layer in it and it checks whether the destination physical address which has come along with the packet matches with its own physical address, if so it sends the packet to the next upper layer that is Network Layer. Now in the Network Layer it checks whether the destination IP address matches with it’s own IP address if so it accepts the packet but now since the packet is to be delivered to the destination machine the destination IP address differs from that of the router. Now the router checks it’s routing table for the route through which the packet has to be delivered and now it recreates the packet with the destination physical address as the physical address of the router to which the packet will be delivered next. This process continues and when the packet reaches the router to which the destination machine is connected, it is delivered. The routing is shown in the following diagram. If a message contains many packets in that case it is not necessary that all the packets follow the same route and instead different packets may reach destination through different path. This is because if the routers find a specific path is busy it looks at the routing table for the alternate path to reach the destination and send it through that route. When the packet is reached the destination then the destination machine evaluates the request and the response is sent to the source following the same procedure but now the destination address is the address of the source machine which had sent the packet initially.